Dash Shaw’s other comics, especially 2010’s BodyWorld, push the boundaries of the comics medium in exciting ways, but they can also be daunting, especially to readers who are not comfortable knowing which panel to read when in a comic book—let alone be ready to turn the pages on their axis. However, Cosplayers is a much more accessible starting point in Shaw’s oeuvre. The one-shot does not play with form as much as Shaw’s other work, but it still showcases his lush color palette and his adventurous concepts. Cosplayers examines the subculture of fans who craft their own homemade costumes in an unexpected way. 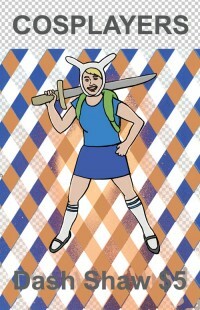 The book’s thirty-two pages are split into several-page strips depicting Verti, a photographer, who meets Annie, an avid cosplayer, and splash pages of (mostly overweight) cosplayers dressed as Danaerys and Kal Drogo, Magneto and Scarlet Witch, and Wolverine atop splashes of color and tessellated eyeballs or de stijl-like gridlines. By acting as normal, OKCupid-using, floor-mopping women, Annie and Verti are reversing societal order. Instead of losers dressing like their favorite Street Fighter on the weekend as an escape from the daily grind of adult life, these are characters that habituate themselves in the fantastic, thus their escape is to act “normal.” “I feel like the nerdiest thing in the world is to be a jock right now,” Verti says on the back cover. Dash Shaw renders his characters with a minimalist flair. Small stipples on Annie’s neck stand in for her cystic acne. Verti’s cat-eye glasses are short-hand for her social awkwardness, and yet Shaw depicts his characters with the hand of a respectful, fascinated artist, rather than with an exploitative gaze. This comic looks to both examine and excise our notions of otaku, nerds, geeks, and the like. Cosplayers will strike a chord with anyone who turns to reading as an escape, be they lit-nerd, comic geek, messageboard troll, or a little mixture of all of the above.